When it comes to transporting important goods and materials, using suitable, reliable load-restraint equipment is essential. If sub-standard equipment is used, the risk of your load becoming loose and potentially damaged is increased, which can have very negative consequences for the person transporting the goods and the more importantly, the people who are travelling around them. Here at SafetyLiftinGear, we supply a comprehensive range of load restraint equipment that you can trust to properly secure your important loads. One of the items that we have in our Load Restraint category is Polypropylene Rope, available in a variety of lengths and thicknesses, perfect for a wide range of restraint applications. If you’re wondering what polypropylene rope is, however, continue reading to find out and some of its benefits! Rot-Proof Material – Polypropylene is a great material for load restraint as it’s completely rot-proof! This comes as a massive benefit for long-term use and storage, particularly when used outdoors where the possibility of it being regularly soaked is high. Other types of rope such as hemp rope, for example, will not be able to withstand such conditions due to bacterial growth. 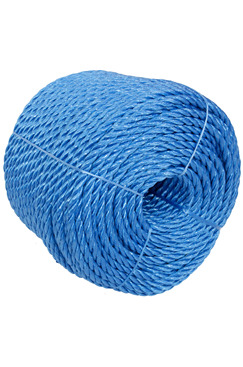 Polypropylene rope, on the other hand, is able to maintain its capabilities and strength for much longer. Ability to Float - At first, this may not seem to be a great advantage, but if you need a rope for boating purposes, a rope which does not float will not last long at all. As polypropylene is able to be easily retrieved, it makes it a natural choice for ropes used in and around water. It’s bright colour also enables it to be easily seen in harsh ambient weather, low-light conditions or against the dark backdrop of water. Robust Construction – One of the ropes most notable benefits is the way it is made. Polypropylene is a hardy polymer which is resistant to many types of glue and solvents. The rope is woven from three-strand yarn making it extremely durable and strong. Polypropylene also has a higher melting point than most common polymers, making it resistant to heat and friction. It also will not splinter, which makes it more user-friendly, prolonging its life even when frequently knotted and untied. These are just a few of the many benefits that polypropylene rope has over its counterparts and why it is such a great option when it comes to load restraint. You’ll be glad to hear that our Polypropylene Rope collection consists of many variations, perfect for any task. To view our full range, simply click the button below. If you have any questions regarding our polypropylene rope or if you are having trouble trying to purchase yours, please do not hesitate to contact a member of our customer service team today! Check our our great selection of rope ascender and descender devices! Hire a Man Basket from SafetyLiftinGear! Brand New Material Handling Equipment from Pramac! Single Use Lifting Slings Now Available at SafetyLiftinGear! Gantry Cranes: More Than 20% Off! Ecommerce Website by Designer Websites Ltd.